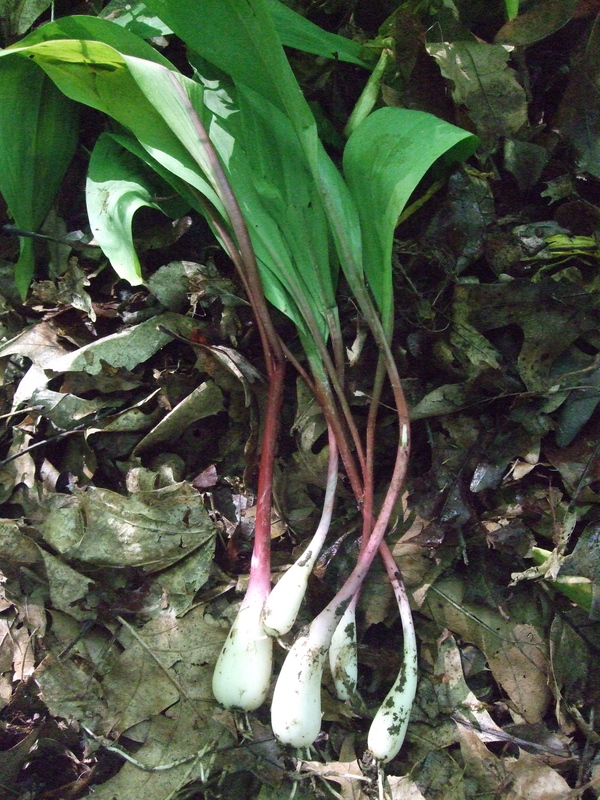 Wild Food – Ramps. What’s a Ramp? In early April the woods behind my house look dead and hopeless. I wait for the day when a patch of brave lime-green leaves poke through the damp forest floor to signal life amid the ugliness. I thought perhaps they were a non-flowering variety of lily-of-the-valley until a fellow hiker on Manitou Island pointed out the same plant there had onion-like roots. The next spring I watched for the bright leaves and grabbed a sharp trowel. One must dig deep, four or five inches, to unearth the bulbs, taking care not to sever the stems. They have strong onion smell, but before I ate one, I searched the internet for information. They’re called ramps. Look for shiny elongated leaves, about nine inches long. Thin, reddish stems lead below ground another few inches to the white bulbs. This year, after my successful asparagus hunt, I was on a roll. With the identification of the ramps certain, I dug up a few and showed them off to my visiting family. 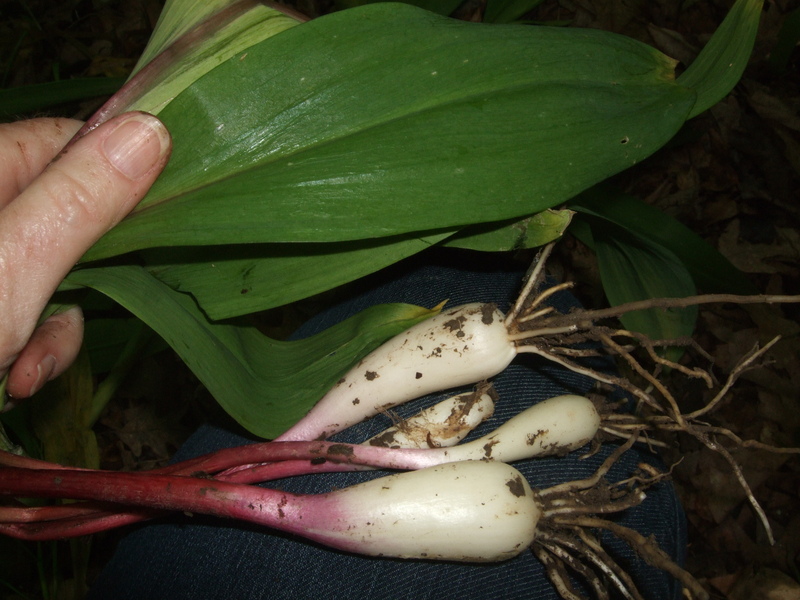 My nature-loving sister and her biology professor husband were thrilled to learn about ramps, so we dug for more, taste-tested, and served them up. We chopped raw ramps for salad and enjoyed the onion/garlic, slightly earthly flavor. I thought a little went a long way, but then got more adventuresome. Ramps added an interesting boost to marinara sauce. Sauteed ramps gave a smooth onion flavor to an asparagus, goat cheese omelette. 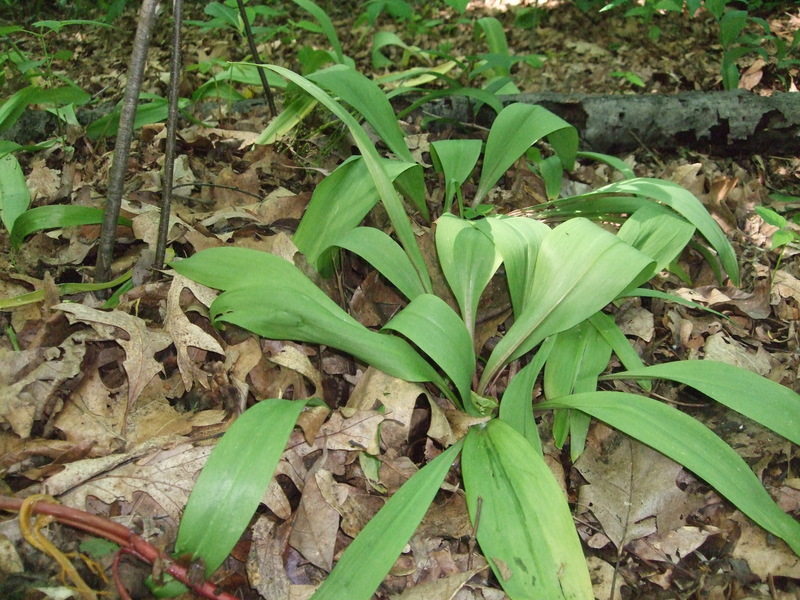 It’s late May now, and the ramps leaves are still out there, but hidden among solomon seal, trillium, and mayapple. The leaves are a bit limp and yellow, but the bulbs still look and smell fresh. Mix seasonings and walnuts in a baggie at home. Dice ramp and celery on trail. Stir it all into the tuna pouch and spoon into scoop-style taco chips. Serves 1. Enjoy. A tasty dish that keeps well in summer temperatures, and adds needed protein to the hiker or backpackers diet. Bring 4 ounce s of scooping type corn tortilla chips or large pita chips. Bring a 7 ounce bag of tuna in oil. Bring 1 ounce of olive oil. In a small pot or in a baggie, mix well the walnut spice bag with the oil and tuna. With a spoon, put a dab of the walnut tuna spread on each tortilla chip and eat.